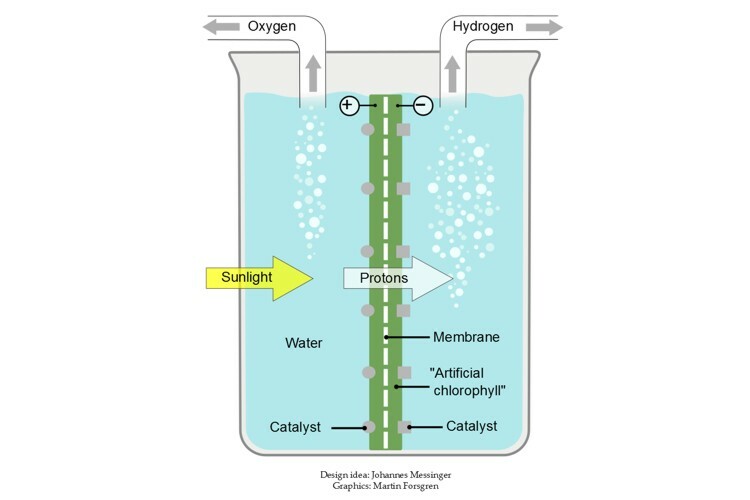 The final goal of this project is a proto-type for a printable membrane that when immersed in water and exposed to sunlight evolves molecular oxygen on one side and molecular hydrogen on the other (see Scheme below). Schematic representation of the artificial leaf principle. The membrane is thought to be made from organic materials. While this poses additional challenges towards stability, it opens the avenue towards simple mass production by roll-to-roll printing technologies. However, also Si and TiO2 based artificial devices are being explored. As catalysts various oxides (Co, Mn, Fe) and co-ordination complexes are investigated.